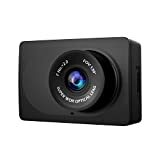 The YI Compact Dash Cam packs great features and impressive performance into a dash camera that is remarkably small. Seriously, this thing is teeny! It’s about as wide as a ChapStick, which means it won’t block your vision at all while it’s mounted on your windshield. Don’t let the size fool you though — just look at you great the video and image samples are in the reviews on the Amazon page! It retails for $50 and Amazon typically sells it for $40, but the coupon code DASH4DAD drops the price to just $27.99 today. Grab one while you can.